We made it safely back to Souris on Sunday. 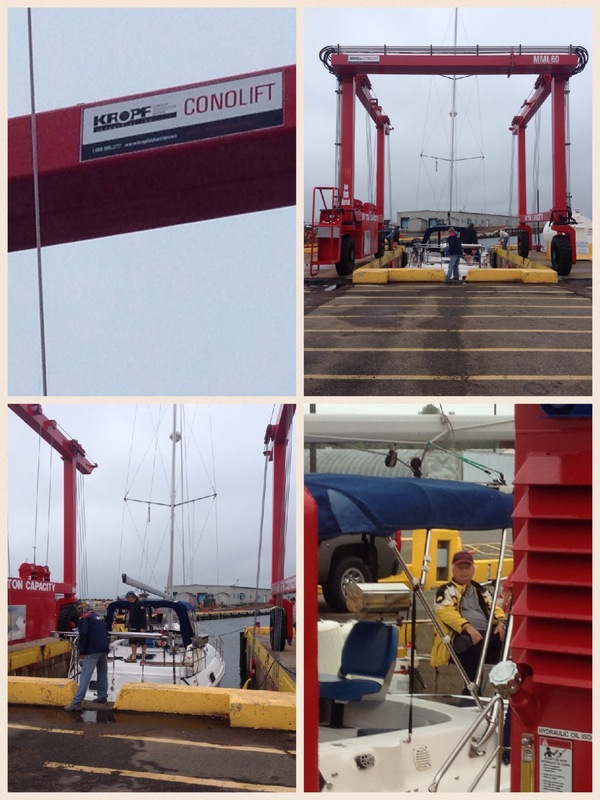 We left Summerside at 6:00 am and thought that we would go to either Wood Islands or head over to Pictou, NS but the weather report for the next day was looking very windy so we kept going until we got into Souris at around 10:00 that night. It was an extremely warm, warm day and the wind didn’t do much for most of the day so it was nice not to be in town where I’m sure we would have roasted. There was enough breeze to keep us cool. We didn’t see much in the way of wildlife except for gannets, seals and a few porpoises so the whole day was just kind of relaxed and uneventful. 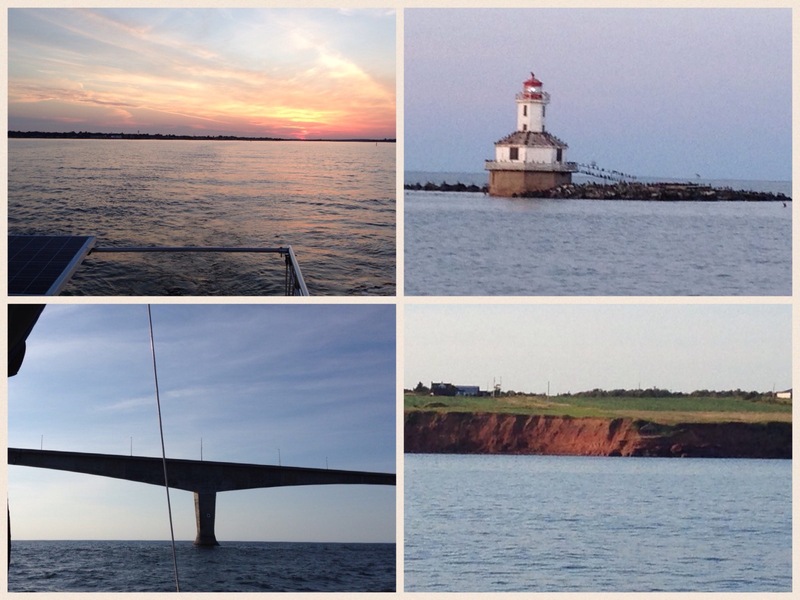 Here are a few pictures of the sunrise in Summerside, the lighthouse which could have been a scene for Alfred Hitchcock’s “The Birds”, the Confederation Bridge and the red sandy cliffs of the island. The sun set at around 8:00 and we knew that we had a couple of hours to go as we really slowed down during the day for some reason. We think it was because we were going against the tide as our speed had dropped to 4.1 SOG (speed over ground) knots and for the rest of the day it had been between 5 – 7. By the time we could see the lights of Souris, it was pretty dark out. We managed to find the right lights for the entrance to the harbour though and slowly made our way in. Here are some pics of the sunset. Our good friend Dale was there to greet us – thank goodness he was because there was only one slip available for us and we had rigged the boat for the wrong side so Dennis had to back in. Luckily, Dale was able to push the boat off the dock and catch the lines. We went to bed at midnight and slept in until 7:00 – we were pretty tired! Yesterday, we started getting the boat ready for winter. We cleaned the dinghy (it was disgusting!) and the fenders (they were pretty bad too), took down the jib without too much trouble and brought down some of the canvas. I was very happy that we were safely tied to the dock as the wind was really blowing. I have a picture of the wind metre showing 36 knots but it did go up to 45 at one point. I’m glad Captain Bligh decided to do the trip in one day instead of two as it wouldn’t have been much fun on the water with 3 metre waves and gusts of 50 – 60 kilometres. We had Dale over for supper and he told us about his adventures. He had headed over to Newfoundland but had a tough time because he either got fogged in or it was too windy or he got caught in rough seas. He says he’s going to try again next summer. 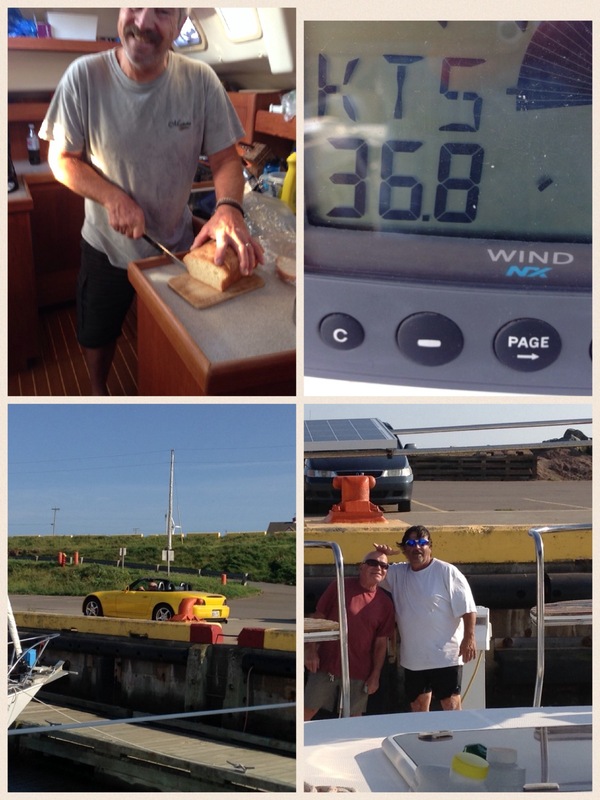 Here are some pics of Dennis eating my mother’s homemade bread – it was delicious – especially toasted, the wind metre, Eric in his car (he’s the guy in charge of the marina), and Eric and Peter. Peter is the man who drives the travel lift. 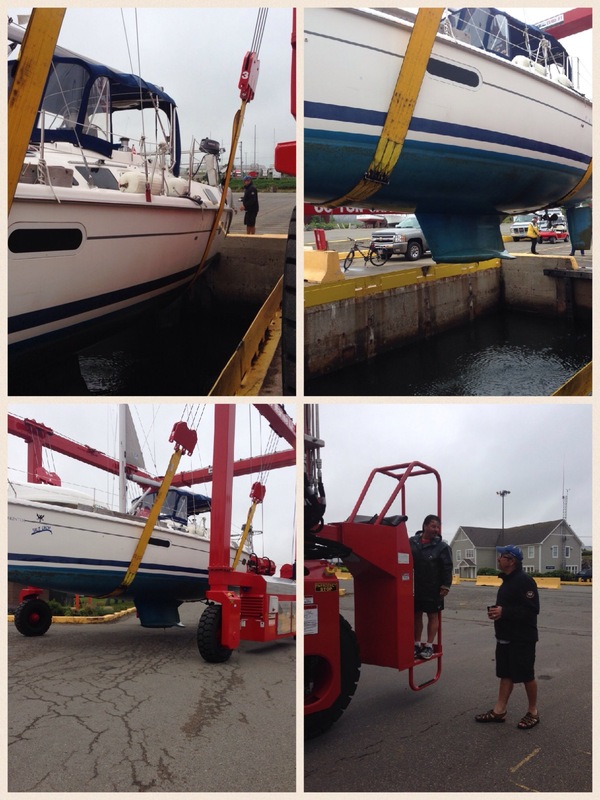 We power washed the boat as it was really dirty after sitting in a marina all summer. 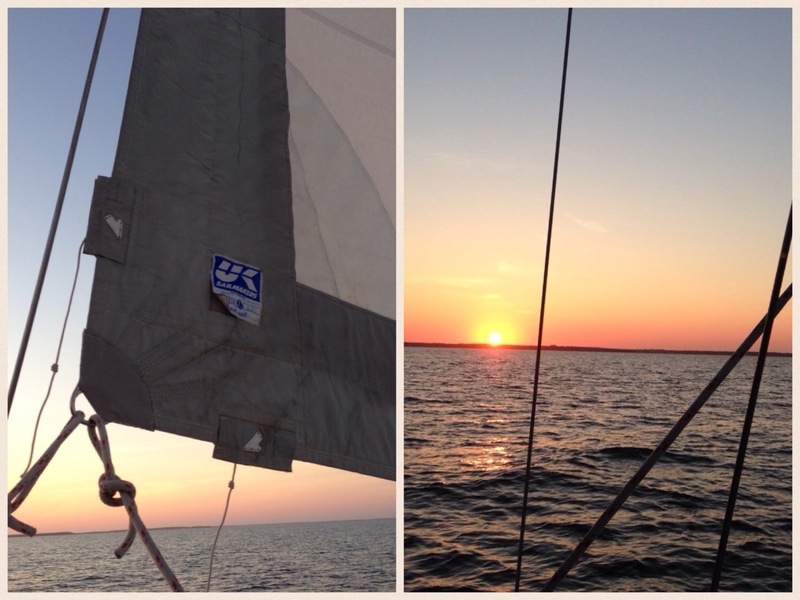 Tomorrow, we have to winterize it, take down more canvas and get the mainsail down. We are waiting for less wind for that to occur. We will also put everything in plastic bags and make sure that every cupboard is left open. It gets pretty humid here so we don’t want mould on the boat although I think that is inevitable. We will head home on Thursday – just a two hour drive now and figure out what we’re doing next summer!